Over the years, I have written a multitude of posts here on PPC Ian about Epik. The most popular ones have been my introduction to my Personal Epik Product Portal Websites, my Epik Product Portal Development Tips, and of course my special Epik Product Portal Tips and Coupon Code. I’m a big fan of Epik, a big developer on the Epik Product Portal Platform (I now own 60 Product Portals), and am now officially on Epik’s Board of Advisors (check out my bio on the Epik Team page). I couldn’t be more thrilled when it comes to everything Epik and today I’m excited to give an overview of some new stuff going on at Epik that you’re sure to love. In July, 2011 Epik acquired its very own registrar, IntrustDomains. You can read all about Epik’s acquisition in this post on the Epik blog. Long story short, the acquisition on Intrust completed Epik’s dream of becoming the most comprehensive domain asset management platform on the Internet. We’re talking about the whole domain name lifecycle here: Acquire, build, manage, and divest. Epik is my registrar of choice and next I will show you how I’m leveraging Epik every single day to manage my domain/website portfolio. Check out the screenshot below, this is what it looks like when I log into my registrar account at Epik. You’ll quickly notice that there’s a world of functionality at your fingertips (I’ll get into that a bit later). First, however, I wanted to underscore an amazing feature that is really helping me out: Epik displays all of my domain names from all of my registrars. I’m able to manage all of my GoDaddy, Moniker, and Epik domains in one convenient location. Recently, I did a quick sort by expiration date and noticed that I had a good 30 domains at Moniker expiring in February. Last night, I leveraged this intelligence and logged into my Moniker account to renew all of the domains. Also, I noticed that I have a few GoDaddy domains expiring on the horizon and will take care of those shortly. Epik makes my life easy. The screenshot below illustrates the menu that appears when I hover over a domain click the “manage” button on the main control panel (previous screenshot). Whether I’m looking to update whois info (such as toggling between public/private registration), forward a domain name, transfer domains in/out of my Epik account, renew domains, organize my portfolio, or virtually anything else I want to do, it’s all in one convenient location. Even better: I can select multiple domains at once and manage them in one bulk update. In short, Epik is one of the most user friendly registrars around. Even better, domain registration fees at Epik are cheap ($10/year) and you get all of this amazing functionality (including domain privacy and domain forwarding, if you want it) for free. In the screenshot below, you can see Epik’s suite of domain development packages. I personally developed 60 of my own domains on Epik’s Product Portal Platform. However, you can quickly see that Epik offers much more than Product Portals. I’m talking about lightening fast web hosting (several different hosting packages), SiteBuilder, LeadGen Portals, Recipe Portals, and Video Portals. When it comes to making money online, Epik has you covered! Looking back at the first screenshot in this account, you can see that all of my domains have an “on sale” price tag next to them. I have listed many of my domains and websites for sale on the Epik Marketplace. I’m in the domain game to make money. Most of my money comes via passive income from developed websites and I’m holding onto most sites for the long term. 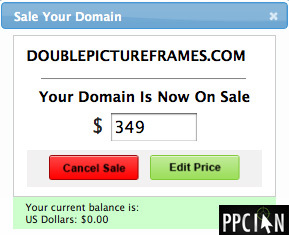 That said, I’m definitely exploring the idea of selling domains and websites in 2012. If I’m able to earn cash by selling virtual assets, I can funnel those earnings into other passive income instruments (dividend-paying stocks or even the development of more websites). Epik owns over 20,000 domains in their own portfolio so they know all about selling domains. Leverage their expertise and platform to sell your domains/websites today. So, there you have it, the most comprehensive registrar around! The crazy thing: I barely scratched the surface of the Epik platform with this post. If you’re looking to acquire, build, manage, and divest domain names, Epik has the entire lifecycle covered. Open your account at Epik today! Recently, I wrote about how my Epik affiliate earnings are up (quite a bit). That post generated a lot of interest in the Epik platform and I quickly got the question: Ian, how much are you making with Epik? Can you share your earnings like you did for eBay and Commission Junction? Today, I thought I’d follow up on my previous post and answer this question with real numbers! I own 55 Epik Product Portal websites. Most of these product portals are brand new websites. They’re domains I’ve acquired within the last few years that I decided to develop on the Epik platform. 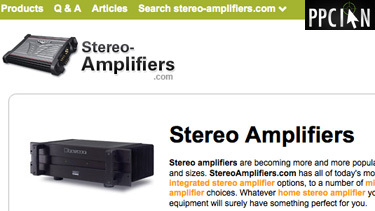 Others are websites I acquired from Epik (such as Stereo Amplifiers, portrayed to the right). All of my Product Portals have custom articles (2 per site) and most have custom header blurbs too (on each sub-section of the site). I spent a ton of time and money building the best content possible because it’s all about user experience at the end of the day. I’m building quality sites that truly benefit the Internet and always recommend over-investing in great content. Between domain registration fees, development fees, acquisition fees, and article outsourcing fees, my total cost is $15,000. Now, $543.74 divided by 28 is $19.42/day. $19.42/day times 365 is $7,088 revenue/year. However, until you’re earning more with Epik, the rev share is 50/50. (You can read more about the Epik revenue share tiers here.) So, my take on the revenue is $3,544/year. As a side note: I’m very happy with Epik’s rev share model, it’s quite generous. Moreover, Epik is a true partner and without the Epik team my sites would not be where they are. The rev share is worth every dollar! Personally, I feel that my revenue is going to come in much higher. Why? Most product shopping happens in Q4 (holiday shopping season). My earnings should jump up during that time! However, I like to be conservative in my financial modeling so let’s just say my annual revenue is $3,544 based on the last 4 week’s data. (Also, I am not factoring in my annual domain renewal fees of approximately $500 but again that should be hugely overshadowed by my holiday season earnings.) $3,544 divided by my $15,000 cost is a sweet 24% yield! I’m a huge fan of cash flow and invest in all sorts of investment vehicles that offer cash flow. I’m talking about dividend-paying stocks, websites (both build from scratch and also buy established websites), and more. Very few investments return a 24% annual yield within the first year of the venture. In the stock market, even if you buy the high yielding tobacco companies or telecom companies, we’re talking about an yield in the high 5% range. I’m not counting capital appreciation here but I’m not counting that for my Epik Product Portals either. Come to think of it, the capital appreciation with Epik Product Portals is much higher than stocks. Why? Sites like Flippa are heating up and it’s a hot market for income-producing websites right now. Just check out my last post about Zac Johnson’s eBook. My end conclusion: Epik Product Portals are one of the best investments around. The websites are truly useful and are making the Internet a better place. I’m finding that by partnering with Epik, I’m earning extremely high yields with scale. My future includes many more Product Portals as I plan to expand my portfolio to well over 100 Product Portals over time. My Personal Epik Product Portal Websites – Learn all about my personal websites on Epik. Epik Product Portal Domain Development Tips – Epik website development tips that work wonders, especially on Epik’s new Product Portal 3.0 platform. Epik Product Portal Tips and Special PPC Ian Discount – Even more Epik development tips and also my exclusive coupon code (PPCIAN10). If you enter this code upon checkout, you will receive 10% off your entire order. My Affiliate Earnings Are Up With Epik 3.0 – Learn about my recent success on Epik since the launch of their brand new Product Portal 3.0 platform. Now that you know a bit about Epik, I’d like to share some of my favorite features of Product Portal version 3.0. 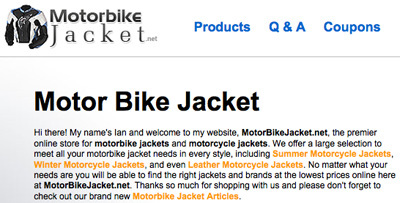 At the bottom of this post, you’ll see a screenshot of my Epik website Motorbike Jacket. As you can see, the site is really slick. Websites on Epik’s new platform are simply stunning. This is great from two perspectives: First, as an owner, I have serious pride of ownership. Second, my sites are converting better than ever (users love the new look and feel). Aside from looking really great, Epik’s new platform is more SEO-optimized than ever. It’s all about content. Anyone reading PPC Ian can appreciate that. I’ve been adding quality, helpful content to my Epik Product Portals (and all my websites) from day one. As a result, search engines have rewarded me handsomely. Epik’s new platform makes it easier than ever before to add articles and place them in really prominent positions on your site. Want to learn even more? I recommend checking out Epik’s Product Portal 3.0 Announcement. When I look at my Epik earnings from the past week (as compared to 4 weeks ago), my earnings are up 5.6 fold. Now, one reason I’m doing well is I own some seasonal domains that do well in the summer time such as Outdoor Sofas. However, the majority of my gains are due to Epik’s new platform. Not only am I getting more visitors but also my visitors are converting better than ever. Product Portal 3.0 (especially when the developer adds tons of great, custom content like myself) is very SEO-optimized. My end conclusion: WordPress is the ideal platform for building a blog. The Epik Product Portal platform, in my opinion, is the WordPress of commerce-oriented domain names. If you’re looking to develop commerce-oriented domains, you’ve got to give Epik a try. And, don’t forget my special coupon code for 10% off your entire order (PPCIAN10). I’m just going to warn you up front, today’s post totally rocks! Not only am I going to present an exclusive Epik Product Portal SEO tip that has been working wonders on my extensive portfolio of 55 Epik sites, but I’m also going to share a special Epik Product Portal coupon code only for PPC Ian readers. That’s right, I negotiated this special coupon code with the man himself, Rob Monster (CEO of Epik), as a favor for PPC Ian readers. So, first of all, what the heck are Epik Product Portals? Epik is basically the WordPress of product comparison shopping sites. It’s an amazing platform that empowers owners of high quality product domains to build out amazing websites that drive extensive value for the user while providing outstanding monetization for the domain owner. Want to learn more? Check out my post about my personal Epik Product Portal websites and then my post about my Epik Development Tips. I’m so confident in Epik that I made a substantial $10,000+ investment in my personal Epik Product Portfolio websites in 2010 and I continue to invest this year. This is my very hard earned money, on the line! So, as part one of today’s post, I wanted to provide a quick and actionable SEO tip for all you Epik developers out there (and Epik developers to be). Since I own 55 Epik Product Portals, I’ve experienced the excitement of testing many different SEO strategies across my portfolio of sites. Over the last few months, a clear winning strategy has emerged and that’s the strategy I’m going to share with you today! That said, results vary and I never recommend going with just one strategy. It’s important to test, test, test and want to underscore that this is just one winning strategy and there are others out there. The blurbs are the same at the top of each page. Check out the homepage versus the outdoor sectional sofas page. 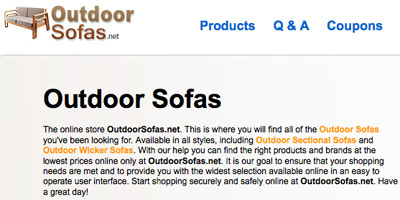 The keyword outdoor sofas in the top blurb refers to a sub-page by the same name and not the homepage, the root domain. There are two articles (and more in the pipeline). An example: double picture frames ideas. Exciting note: Epik provides amazing packages to assist with article creation. They will even upload articles (you write on your own or via their own team). I link to the articles page in the blurb at the top of the homepage. Even though articles are direct linked on all pages Epik Product Portal sites, this extra link to the articles page in my homepage blurb helps search engines find (and weight) my custom, high quality articles. Remember: Content is king! Get credit for that content by linking to it. I link back to the homepage with the keyword double picture frames from within my articles (but am careful to not overdo it). This helps add authority to my high quality exact match domain name and tells the search engines what my site is all about. Instead of linking to a sub-page, the keyword double picture frames within my main blurb on the homepage links right back to the homepage. Like the links within the articles, this helps reinforce the exact match domain name with search engines. That said, be careful to not overdo it. It’s a balancing act. I write custom blurbs for every page of my site. For example, check out my metallic picture frames page. It’s different than the homepage and is optimized for these special metallic picture frames. Within these sub-pages, I sometimes link back to the same sub-page with the topical theme of the page as anchor text. These recursive links help tell search engines what your page is all about, although I don’t use this strategy on all my sites. I vary it a bit, and don’t like to follow a fixed template all the time. So, there you have it! I am very confident that if you employ these simple tips on your current (or soon to be) Epik sites, you will experience great returns! At the end of the day, these tips are all about adding quality content (content that users will read and enjoy is always king). Now, the real fun! So I’m personal friends with Rob Monster, CEO of Epik. Rob is a serial entrepreneur, business leader, and overall genius within technology. He’s someone I definitely look up to because I’m personally trying to achieve fame in the corporate world of online marketing. You would think with his background that Rob wouldn’t have time to talk to individual Epik developers. That couldn’t be further from the case! I can’t get over the fact that Rob (and his entire team) always goes above and beyond to assist individual Epik developers with their questions and ideas, even though Epik has grown into a large company. Make sure to mention that you’re a PPC Ian reader and the Epik team will give you the red carpet treatment for sure! Whether you’re a current Epik developer or a new one, I highly recommend taking advantage of this coupon code. If you’re new to Epik, why not start small? Epik Product Portals start at $249, and only $224.10 with the PPC Ian discount. As an online marketing professional, it’s my opinion that you cannot afford to miss this opportunity. Of course, if you have any questions, please feel free to post them here on PPC Ian! I’m looking forward to some Epik discussion. Epik product portals rock! Last time, I wrote all about my personal Epik product portal websites. I currently own 45 developed websites on the Epik network, three of which I highlighted in my last post. Another few examples include Motorbike Jacket, Velour Tracksuit, and Cheap Desk. My last article was a real hit and I’m especially thankful for the awesome comments from all of you! Today I’m thrilled to continue the Epik discussion. Specifically, I’m going to share actionable tips that will help you make money with Epik. So you’re convinced and ready to launch your first Epik product portal website. Great stuff! Whether you’re new to domain names or a seasoned domainer with hundreds (or even thousands) of domains, there are some important things to consider when choosing which domains to develop on Epik. First and foremost, you’ll want to pick a name that is an exact match of a product sold online. If you have other types of names, Epik can still help, but you’ll want to look at their other platforms instead of the product portal that I’m so familiar with. Second, I suggest picking an exact match domain that gets at least 700-1,000 or more global exact match searches per month according to Google’s keyword tool. 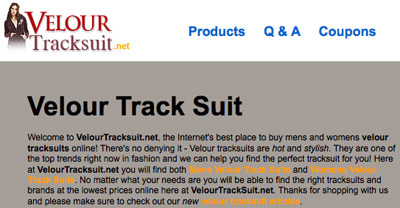 My site Velour Tracksuit gets 1,600 global exact searches per month. If you start venturing below this level, you won’t have enough searchers to make it worth your while. Third, you’ll want to pick a name name that’s either a dot com or dot net domain. You’ve heard me talk a lot about dot me, dot co, and other TLDs here on PPC Ian. I’m a huge fan of many TLDs and have developed sites on dot com, dot net, dot org, dot me, dot co, dot info, dot us, and dot biz. However, for the purposes of Epik product portals, they’re looking to really preserve the integrity of the network and stick with high quality dot com and dot net for product portals since the main purpose and intent of these TLDs is commerce. This surprised me a bit at first, but now it totally makes sense. I have a ton of dot org product domains and have been building them out differently – I’m going the article route with my dot orgs and making them more informational whereas I’m going the product sales route with my dot com and dot net domains. The strategy has been working great! Have a killer domain that’s not a dot com or dot net? Share it with the Epik team! They’ll definitely let you try alternate TLDs for product portals if they’re category defining names. As a side note, you may be wondering about domain names with hyphens in them. Whereas a few years ago, these domains were looked down upon, they seem to be in everyone’s portfolios these days. Taking myself as an example, I developed the domain Cheap-Desk.com on Epik. This exact match hyphenated domain name has 1,900 global exact match searches per month, it’s a great name! Here’s the rule when it comes to hyphenated domains on Epik: Epik totally allows and supports great hyphenated domains on dot com but does not entertain them on dot net. Now, if you’re like me, you’re thinking that rules are meant to be broken! Have a great dot net domain with a dash in it? I would certainly run it by Epik, but it’s going to have to be a killer name to get accepted. So my first few tips today focused specifically on selecting great domain names for development on Epik. Now, I’m going to shift gears and discuss a few high leverage tips for making the most of your sites once they’re live on Epik. My strategy is really a three tiered one. First and foremost, I always make sure to upload custom articles to my Epik sites. Taking Motorbike Jacket as an example, you can see that I have custom articles about Buying a Motorbike Jacket and Motorbike Jacket Purchasing Tips. I had these great articles written for me on ELance (always go with the more expensive writers, they do better work) and were super easy to upload with Epik’s WYSIWYG editor. My golden rule: Each Epik product portal needs at least two custom articles. Each Epik product portal has a variety of product tabs. 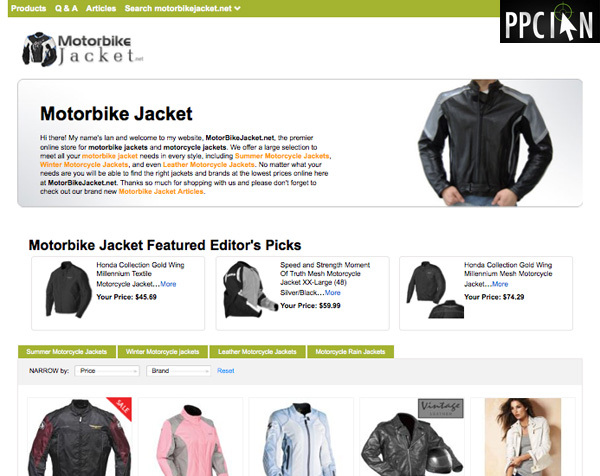 On MotorbikeJacket.net, for example, I have tabs for Summer Motorcycle Jackets, Winter Motorcycle Jacket, Leather Motorcycle Jackets, and Motorcycle Rain Jackets. Check out the blurb at the top of each of these pages! They’re all custom and unique. They all differ from the custom blurb at the top of my main homepage. Moreover, if you view the source code of these pages, you’ll see that each has a custom meta title and meta description as well! I have my ELance writers write this custom content when they’re writing the articles. This is really your chance to personalize your Epik Product Portal and get rewarded by the search engines! To summarize, my second content tip: Write custom blurbs, meta titles, and meta descriptions for all product tabs on your Epik sites. It’s super easy to upload this custom content via Epik’s back end tool. It’s really as easy as that! These simple tips will get you off to an amazing start on Epik. Once you’ve completed these steps, it’s all about repeating with more domains and also continuing to add more content to your existing domains. Search engines (and users) love to have as much useful content as possible. As my final tip for today, don’t forget to reach out to the Epik team. They can help with an amazing number of things and are partners in your success. Leverage their expertise to make as much money as possible on Epik. Hey Everyone! I really enjoy reading affiliate marketing blogs that discuss first hand tips about making money online. I enjoy those blogs even more that are open about current initiatives the blogger is working on. In that spirit, I’m going to share one of my major affiliate marketing initiatives today and also some of my personal domains that I’ve been developing! Drum roll please… I have been hard at work developing my domain portfolio on the Epik.com platform! Today, I’m going to discuss my personal experience developing 45 domains so far on Epik. First Things First, What’s Epik? Have you heard of Epik? If not, don’t worry. It’s super new. I actually had no idea what the heck Epik was until I went to T.R.A.F.F.I.C. back in January. It’s at this awesome domaining conference that I heard Rob Monster Epik’s CEO speak. In my opinion, Rob delivered one of the most fascinating Internet Marketing presentations I have ever heard. It’s at this time that my interest in Rob’s company, Epik.com, took off. What is Epik? It’s a revolutionary platform that allows domain owners to develop their domains with more scale, efficiency, and quality than ever before. They offer a variety of platforms to develop different types of domains: product, directory, reference, Q&A, and poll. Epik is probably best known for their product platform that allows anyone with a product-focused domain to quickly build an online store that delivers a substantial user experience. After the T.R.A.F.F.I.C. conference, I went home and added Epik to my to do list. However, it totally slipped from my mind and priorities for quite a few months. You know how it is, right? There’s 100 things to do and stuff slips. However, back in August, I got hyped up again. Time was passing fast and my domain portfolio was growing faster than I could keep up. Domains just sitting around don’t make money, after all. They’re liabilities and not assets! Parking doesn’t really work anymore. This all turned into my goal: Develop all (or at least most) of my growing product-focused domain portfolio on the Epik platform. So I went for it! I developed 45 Epik product portals! Just a few examples include: Kids Computer Desk, the premier place to buy kids computer desks online, Petite Jacket, a store specializing in fashionable women’s petite jackets, and Narrow Dishwasher, your resource for finding space saving narrow dishwashers for your kitchen. Each of my sites has custom header text on each tab and sports custom articles. 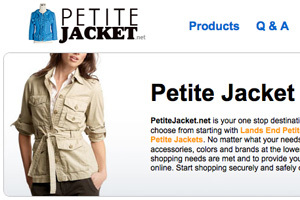 For example, check out my articles about Petite Jacket Sizing and Petite Jackets and Coats. I couldn’t be more proud of these sites. They addsubstantial value to the user, they look great, and they’re making me money already! Better yet, I was able to develop them faster than ever before due to the power of the platform. So, how does this all work? It’s quite simple. Each product portal costs $249 and carries with it a 50/50 revenue share arrangement (although the split shifts more in your favor as you hit higher revenue tiers). For $249 (discounts are available if you commit to volume development like myself), you get a custom logo, custom header, and your initial site fully built. Moreover, you get expert support from the amazing Epik team. I have been in very close contact with Rob Monster himself and have gotten a huge amount of help. In my opinion, this price is a steal! You can easily pay $249 for just a custom logo on other sites. Once your initial product portal is live, it’s time to add articles, custom headers for the different tabs, and custom meta descriptions. Don’t worry! All of this is really easy with Epik’s cutting edge platform. Everything is fully hosted on Epik’s servers so you don’t have to do any work around server configuration or uploading of files. Moreover, this gives Epik the flexibility to make upgrades to your sites such as their current holiday deals. In my particular case, I have been outsourcing all articles and header text so all I have to do is play middleman. Please note that Epik is a total solution. They also offer a variety of packages to help you get content on your site if you’d like the help! My conclusion: Epik rocks! I plan on developing another 55 sites within the coming year to round out my portfolio at 100 Epik sites. I have been able to get sites live that make money right away, sites that look better than others which took twice as long to build, sites that offer scale I have never before seen. As the Internet evolves, it’s all about verticalization. As someone who’s worked extensively in the product shopping vertical at shopping giant NexTag, it’s my opinion that Epik is the future of online product shopping. Stay tuned, I’m going to write more posts about Epik.com in the future, including specific guides on how to use their system. I couldn’t be more excited, I already received my first check from Epik and can’t wait to see them increase in size as each month passes! Of course, I do have a lot of hard work ahead in terms of adding content and building quality inbound links.